Perhaps surprisingly, I was an Art History major in college. And while the massive ‘curator boom’ never really seemed to happen, I don’t regret my choice of major, and even find it coming in handy. Like today, when I get to share with you what may very well be the first POV painting from inside a car. This painting, from the collection of the Cleveland Museum of Art, is called The Windshield, On the Road to Villacoublay. Villacoublay was a small semi-military airport just outside of Paris. Matisse’s son, Pierre, was driving Matisse to the airport in the afternoon, in their old Renault (I think it’s a 1910 or 1912 or so Renault Type CB or CG — I’m not really sure) when Henri got an urge to try a painting of his view of the road from inside the car — an idea which I believe may be the first of its kind? Due to wind and the buffeting of the car, sketching the view was tricky. 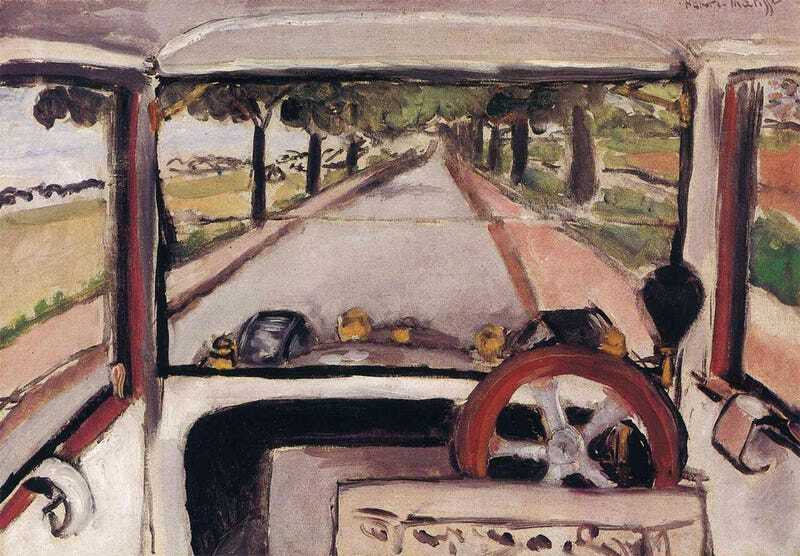 In the final work, Matisse removes the driver and any other road traffic, but leaves the top of his own sketch of the same painting visible, giving the work a strange meta-image quality. 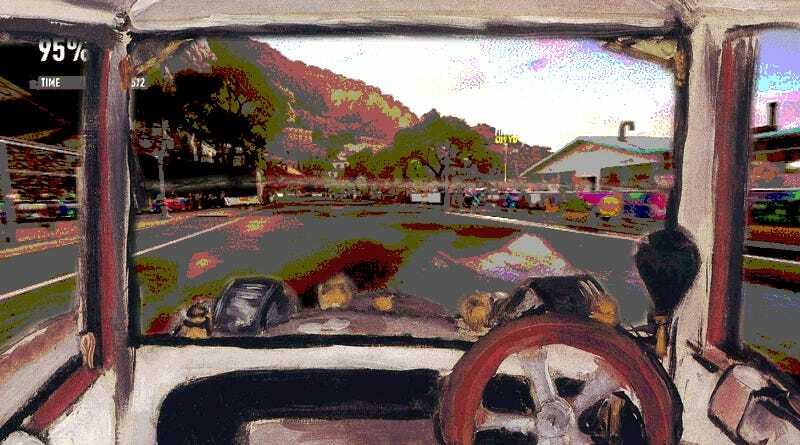 By removing Pierre, the view is that of the driver, with the starfish-centered steering wheel right in front (on the right, interestingly), and a clear view through the horizontally-split glass of that flat windshield, giving a good look out onto the tree-lined road and over the coffin-nosed hood, big brass lamps, and separate fenders. At the time of this painting, cars, in one form or another, had been around for well over a century, though admittedly in very limited numbers. This was the era when car ownership was really taking off, so it’s not that surprising that this is the era a driver’s-eye view painting came around. What is a bit surprising is who it came from — not an Italian futurist or someone very focused on the new, the modern, motion and the machine age, but from Matisse, and artist already well-established and in middle age. I’m not ruling out that an earlier driver’s POV may exist, but I’m not holding my breath, either. Whether it’s first or not, though, doesn’t really matter. Windshield is a fascinating work on its own, a fascinating artifact of the dawn of a new age. Plus, I really like seeing Matisse’s coarse, gestural brushwork in this context, and think this would be a great starting point for someone to make a really painterly racing video game. Here, I’ll even make a transparent PNG of the car to get you started!